The New York Times examined the popularity of today's Super Bowl participants - the Green Bay Packers and the Pittsburgh Steelers - in Madden NFL 11 online play. By years' end they were, unsurprisingly, among the most popular. 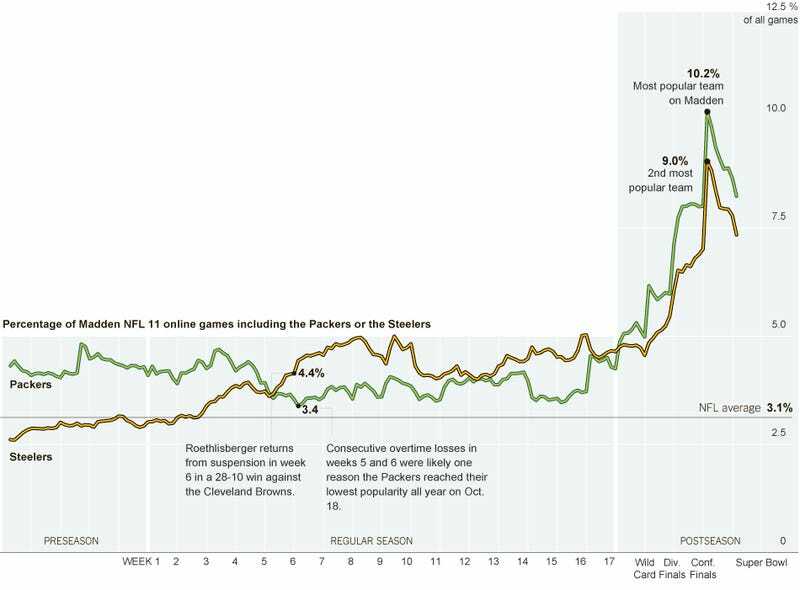 Both teams, which boast large national followings, hovered around the average for most of the season (used in 3.1 percent of all games) but during the playoff weeks, saw their popularity surge. The week of the NFC and AFC conference finals, the Packers and Steelers were No. 1 and No. 2, respectively. The most popular team in online play for the entire season was the Philadelphia Eagles, undoubtedly because of the multiple threats presented by quarterback Michael Vick. The least popular team for the entire year was the Arizona Cardinals, who played in the Super Bowl just two years ago.